After visiting Monet's house and garden in Giverny, France, I knew I'd have to recreate it in miniature one day. I've been a fan of Monet's since I "discovered" him in college. The day I spent at Giverny was one of the best I've ever spent. I created a generic version of Monet's studio. This way, I could put in all my favorite paintings from each of his periods. 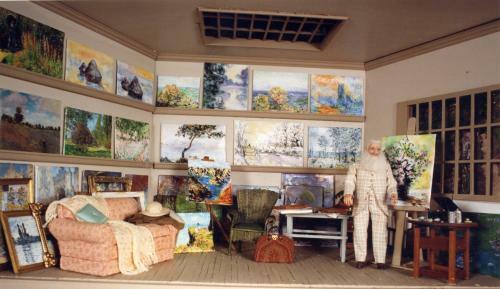 My friend, Lucia Vanover, created miniatures of a dozen of my Monet "favorites." You see those on the back wall and on the easels. How she did it I'll never know, but they are wonderful copies. I later discovered I could use a color copier to reduce some other paintings and actually print them on canvas-type paper. The combination gave me a wonderful mix of paintings. The doll is by Carol Kubesh of Carol's Creations in Minneapolis. Monet looks so real with his cigarette that I felt I'd met the man himself. I found Monet's light and dark yellow dining room utterly bewitching. There was no doubt a painter had created it. I searched for five years for the perfect pieces to put in the dining room, then put it all together. I researched the Japanese printmakers that Monet liked and color-reduced their works to hang on the wall. 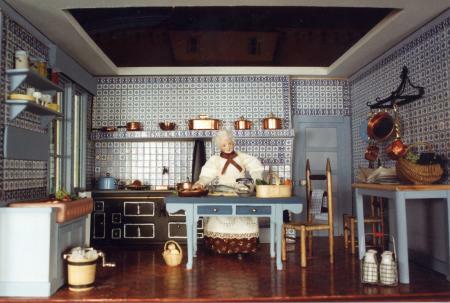 Bob Bernhard modified the cabinets to look like Monet's, and Mary Eccher made Monet's favorite "Green green" cake and other dishes to put on the table. The worst problem was getting the yellows exactly right; I must have painted this room 10 times. I "fudged" a little on the floor; I changed the red and white squares Monet used to blue and white, because the red clashed in miniature. This is Monet's kitchen from his house in Giverny. I bought the kit and made it on my own. It looks so much like the original, it takes my breath away!! I added my version of Monet's cooking journal (pages copied from the book, Monet's Table and reduced to the proper size). My friend, Micki Pugh, made the basket and the beautiful grapes on the side table. Mary Eccher duplicated some of Monet's favorite foods for me; the fish on the table is a pike from Monet's water lily pond. A basket of peaches and an ice cream maker are ready so the cook can make Monet's favorite peach ice cream. 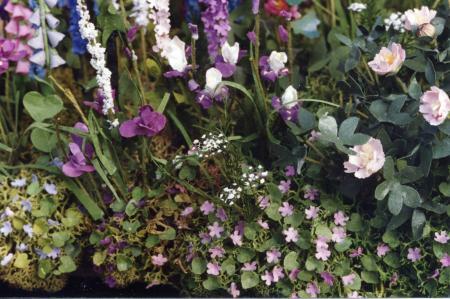 I convinced Betsy Johnson, a fellow miniaturist who knew how to create flowers to teach me. We researched what flowers actually grew in Monet's garden at the time of year we chose (late spring, early summer). Our only aberration was to include the nasturtiums on the path to soften it a bit. We found a picture of the facade of Monet's house in a calendar and used it for the background. We added pieces of Ming fern to the background, then placed tulips and forget-me-nots in front of it to simulate the beds just in front of the house. To create perspective, the arches get smaller as they get further from the house and the path narrows as it goes back The entire piece is about 22" wide by 15" deep and contains about 10,000 leaves and petals. We painted oriental rice paper the colors of the flowers and leaves we wanted and used special punches to cut out the petals and leaves. We assembled each flower, one at a time, experimenting until we got them just right. 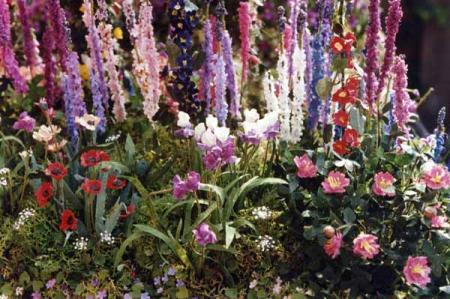 For example, we made eight or nine dozen irises in various colors. 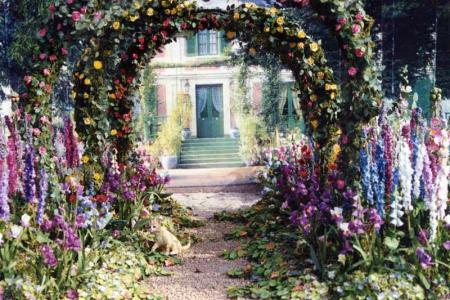 We duplicated Monet's special orange-red poppies and made peony bushes, delphinium, hollyhocks, tulips, forget-me-nots, aubrietia (ground cover) and climbing roses in three colors for the arches.